The spread of the Industrial Revolution throughout Britain in the early 19th century created a new middle class with money to spend on decorating their homes. Fine porcelain figures from the Meissen factory in Germany had been popular but expensive during the 18th century, and in the following century the Potteries in Staffordshire found a market for their cheaper earthenware figures. In a period when literacy levels were low and news hard to come by outside the main towns and cities, the figures became a form of visual literacy depicting key personalities of the day from politics, royalty, sport, literature and entertainment. 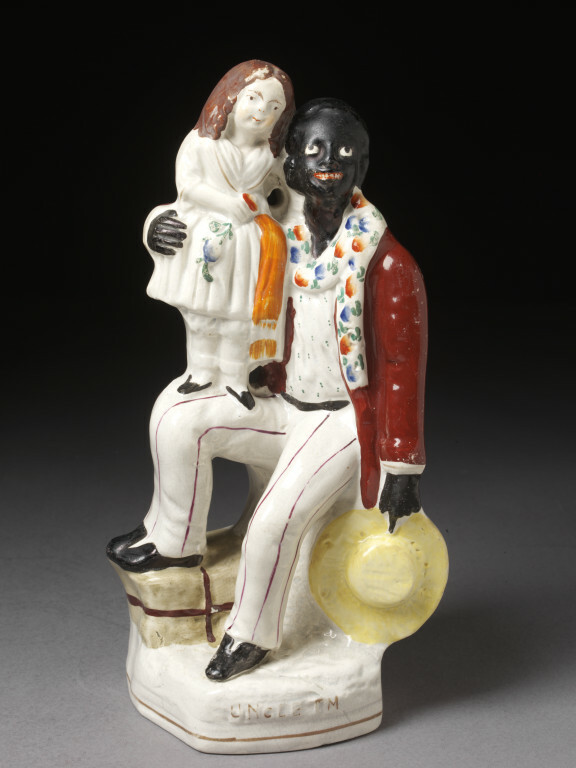 This Staffordshire figure group represents ‘Uncle Tom’ and ‘Eva’, two characters from the anti-slavery novel Uncle Tom’s Cabin by the American author Harriet Beecher Stowe, which was first published in serial form in 1851. The novel focuses on the tale of Uncle Tom, a long-suffering African American slave. Eva is a white girl whom he rescues from drowning then is employed by her family at their plantation. Uncle Tom’s Cabin was the best-selling book of the 19th century and has been credited as a driving force behind America’s anti-slavery movement. However it also contributed to the negative stereotyping of black people, particularly in the character of Uncle Tom who passively accepts his fate. 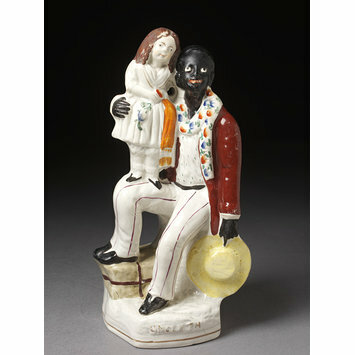 Figure group on square base in moulded lead-glazed earthenware painted with enamels and depicting Uncle Tom with Eva on his knee.